All Nebraskans are stakeholders when it comes to the well-being of the state's water resources. In addition, Nebraska's fish and wildlife rely on clean water to live. When using pesticides, you have a responsibility to keep Nebraska's water unpolluted and safe for all to use. Dutiful handling, transportation, application, storage, and disposal of pesticides is essential in preventing water contamination. Nebraska Extension's pesticide safety publications can help you in this effort. Don't miss out on any water-related articles. Sign up for UNL's Water Column Newsletter. Reading a pesticide's label is the first defense against leaching and runoff, which lead to the contamination of watersheds. The label is a legal document that provides specific information and instructions to help avoid these problems. Learn more about understanding a pesticide label from Nebraska Extension. A pesticide's label specifies its maximum application rate. Applying more than this rate is illegal and can be a serious cause of leaching/runoff. Soil types vary greatly. Soil that is coarse or sandy tends to be more penetrable and is prone to leaching. Soil that is fine or high in clay tends to be less penetrable and is prone to runoff. Read more about soil structure from UNL Water. Many pesticides are toxic to fish and other aquatic life. Labels may include safety recommendations such as buffer strips to help avoid dangerous leaching/runoff. Read more about Planning a Riparian Buffer and Installing a Riparian Buffer from Nebraska Extension. Explore UNL Water's Groundwater section for helpful tools and information on Nebraska's groundwater. Pesticides can affect surface water as well. 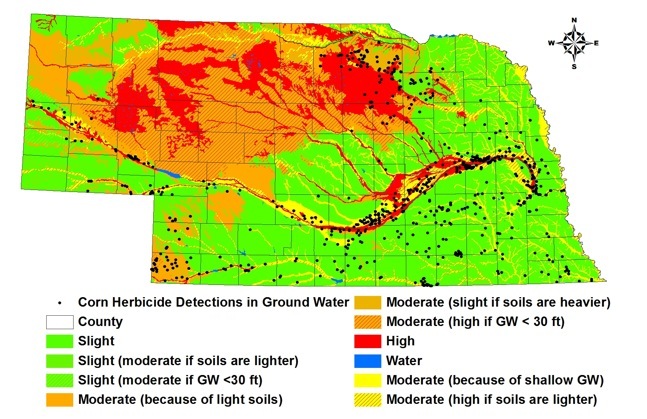 Learn more from UNL Water's Surface Water section. Clean drinking water is essential to healthy living. When contaminants, including pesticides, enter the watershed, the safety of both public and private drinking water is jeopardized. The EPA sets regulatory limits on the acceptable amounts of certain contaminants in public water supplies. Private drinking water is not regulated by either state or federal drinking water mandates in Nebraska. Explore UNL Water's Drinking Water and Water Wells section to find detailed information and resources about the protection of drinking water. Watersheds and community drinking water systems continue to be monitored for atrazine levels. The EPA provides oversight for these and other triazine-related assessments. Atrazine - Background and Updates from EPA. Recommended Best Management Practices for Surface Water Quality from NDA. Widespread use of soil fertilizers over many decades has led to increasing nitrate levels in Nebraska's groundwater. Excess fertilizers from agricultural lands and residential areas are types of nonpoint source (NPS) pollution. Read more about NPS pollution and what you can do about it. Most Nebraskans rely on groundwater as the source of their drinking water. When nitrate levels in water exceed acceptable limits, the health and safety of those who drink it, especially children and pregnant women, are at risk. This danger has forced some communities to install expensive purification systems to keep residents safe. In 2011, four Natural Resources Districts (NRDs) and the Nebraska Department of Environmental Quality (NDEQ) teamed up to develop a management plan for combatting nitrate contamination in the Bazile Groundwater Management Area (BGMA). In 2016, the EPA accepted their plan, which became the nation's first groundwater management plan to receive funding through section 319 of the Clean Water Act. The four NRDs and NDEQ share data from ongoing sampling and analysis in the BGMA, as well as evaluation of the project, with the public at area meetings and with producers at nitrogen certification classes. The NRDs' boards of directors also receive this information. The project's 20-year assessment plan exemplifies the need for long-term adoption of responsible practices to improve groundwater quality. Historical detections of four corn herbicides in ground water compared to relative ground water vulnerability (alachlor, atrazine, metolachlor, and simazine). Data are from the University of Nebraska-Lincoln Conservation Services Division (CSD) (1999) and Nebraska (2000). Nebraska Conservation and Survey Division. 1999. Pesticides and Groundwater: An Applicator's Map and Guide to Prevent Groundwater Contamination.